Stephen Malkmus, vocalist with the recently reformed US indie legends Pavement, once astutely observed that "there are forty different shades of black, so why are you complaining?" Black will probably always be the new black in fashion terms, but unfortunately for graphic designers there really are many shades of black, and controlling them, especially for print, can be very tricky. On your computer monitor, colour is represented in the RGB colourspace, whilst in print, it's CMYK. It's a straightforward process to convert from RGB to CMYK, and this is usually done just before you export a .tiff file to Illustrator or InDesign, in preparation for adding your type and laying out your design. But it can lead to some really complicated problems when it comes to printing. 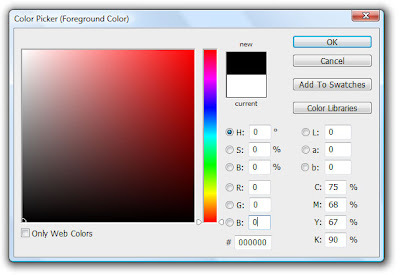 'Photoshop Black', in RGB, is represented as R0, G0, B0 or #000000 - no colour in any channel. In CMYK, 'True Black' is represented as 0C, 0M, 0Y, 100K - no ink except 100% black. Of course a screen can't render CMYK colour, so both blacks will look the same on your monitor, but they are actually not the same colour in print. To demonstrate, if you fire up Photoshop and select black at #000000 and then check the equivalent CMYK value, you might get a surprise - it's actually 75C, 68M, 67Y, 90K - nowhere near True Black. This results in mismatched shades when an image with a black background is edited in Photoshop, then gets placed in Illustrator or InDesign into a black canvas area. It all looks awesome until it pops out of the printer. You'll be editing your poster image with a mucky grey colour instead of a nice deep black. Neither of these solutions seems to be the right one, and in fact, even True Black in the CMYK colourspace produces a grey result. This is because only one ink is used during the printing, and that one layer of ink doesn't have the sort of depth you get by mixing the four inks that make up CMYK colour. So what is required is a combination of inks to produce a 'Rich Black'. Designer black is 30C, 30M, 30Y, 100K (a dark slightly cool black). Other 'designer' combinations include 60, 40, 40 100 and 40, 60, 40 100. So Which Black When and How? The solution is to pre-select the rich black combination you plan to use. Then convert the black areas in the raster image to those values. The file then gets placed in the page layout software, where the background is sampled to the same combination. So in the end, a mix of rich black for black areas, and true black for type is required. Both Illustrator and InDesign feature a clever setting to control how your blacks are rendered on screen. and to let you see where they are on the screen. a) Display All Blacks Accurately will show pure CMYK black as dark grey. 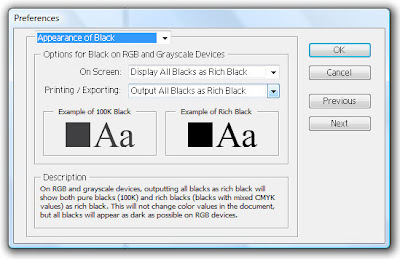 This setting allows you to see the difference between pure black and rich black. 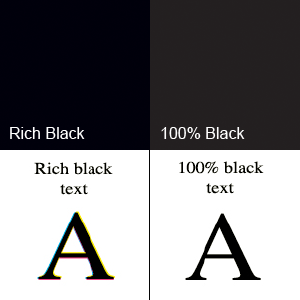 b) Display All Blacks As Rich Black shows pure CMYK black as jet black (RGB=000). This setting makes pure black and rich black appear the same on‑screen. Rich Black, can you spare a dime?